"We have seen on this campus and across the nation that people are being punished for their Christian views." -Congressional candidate, Kevin Cavanaugh. Mark Holden, a 22-year-old history major, tells me he was ordered to leave a lecture hall after his professor objected to him reading the Bible before the start of the class. Holden alleges that Professor Heather Martel ordered him to put away the Good Book around six minutes before a scheduled history class. It's unclear why she objected to the reading of God's Word. According to her biography, Professor Martel is a noted scholar who is working on an essay titled, "The Gender Amazon: Indigenous Female Masculinity in Early Modern European Representations of Contact." She also teaches classes on Global Queer History and Feminist Theory. When Holden declined to stop reading his Bible, the professor summoned Derek Heng, the chairman of the department. Heng then proceeded to explain the situation. Holden recorded the conversation and turned it over to congressional candidate Kevin Cavanaugh. In turn, Cavanaugh provided me with a copy of the audio. "So Professor Martel says that she doesn't want you sitting in front of her because you put, you know, a Bible out, right?" Heng said. "So she doesn't want me in the front because I have my Bible out," Holden replied. "No, I think she, I mean, well why do you have your Bible out anyway," Heng asked. After a bit more back and forth regarding the dynamics in the classroom, the chairman of the department got to the heart of the issue. 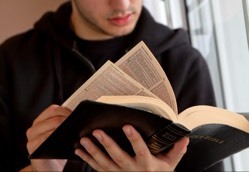 "So, will you, will you, will you, put your Bible away," Heng asked. The incident occurred back in February, but just recently became public after Campus Reform reported on controversy. Holden had previously drawn the ire of his professor during a classroom discussion on assimilation. "All the students agreed with her that assimilation is oppressive and evil," Holden said. "I suggested there are both positive and negative aspects to assimilation." As an example, he referenced a report about two Muslim men in California who reportedly said the Koran justified doing terrible things to women. "She told me I was a racist and she would not tolerate that kind of racism in the class," Holden said. "I told her Islam was not a race and I was only talking about what the two Muslim men as individuals said—I was not making broad claims about Islam or my interpretation of the Koran." I reached out to Holden and university officials for their side of the story—but so far they have not returned my calls. However, I did obtain an email Martel sent to Holden warning him about "disruptive behavior." "For the remainder of the class, I will ask you to move to one of the desks along the wall by the door," she wrote. "The roll sheet will be passed to you. You will make sure that students who come in late sign in. I will also require that you respect me and the other students in the class by acting in a civil manner." In a separate email addressed to the entire class, Martel vowed to "re-instate civility" in the classroom. "I want this to be clear: hate speech does not meet the definition of respectful discussion and will not be tolerated," she wrote. "In law, hate speech is any speech, gesture or conduct, writing, or display which is forbidden because it may incite violence or prejudicial action against or by a protected individual or group, or because it disparages or intimidates a protected individual or group." Something tells me Christians and Conservatives are not considered to be a protected group at Northern Arizona University. "If you are a Christian, you are being targeted," Cavanaugh told me. "Christians are being silenced." "If free speech is not permitted on a public university campus, federal funding should be refused," he told me. "If you want to limit free speech, don't take federal money." "We have seen on this campus and across the nation that people are being punished for their Christian views," Cavanaugh said. That may or may not be the case here—but based on that audio recording—there's not much wiggle room. 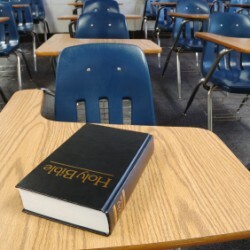 The cold hard reality is a student was yanked out of a classroom for reading the Bible. Woe be unto us, America.